It was very warm yesterday with clear blue skies in every direction. I took the opportunity to head inland looking for something to paint. With one month of spring to go, the paddocks are starting to lose their winter greens and take on the warm, dry colours of summer. I drove around for a few hours before ending up at Bluff Knoll, the highest peak in southwest Western Australia. I painted here one morning a year ago (see Bluff Knoll) and in January this year (See Bluff Knoll in January) and while I was happy enough with the sketches I'd done on both occasions, I felt it was worth another go to try and capture the essence of the bluff. 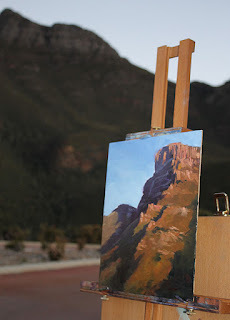 By the time I'd set up my easel, there was only about half an hour left until sunset. 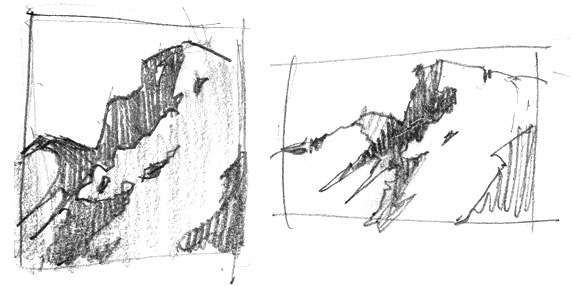 I decided a thumbnail sketch was in order to ensure I knew where I was headed before the light changed too much. I tried two formats, each sketch taking less than a minute. I decided that the vertical format gave me a better feeling of the towering nature of the mountain. I was particularly interested in the zig-zag line created where the major shadow area met the sunlit area. There's a very interesting piece of geology up there, where the sandstone forms a turret-like ridge that catches the sunlight, but it would fall almost dead centre in my picture so I couldn't make too much of it and decided, instead, to draw the eye up to the cliff face. I quickly washed in my major shadow area with a mixture of ultramarine and crimson, thinned with low-odour mineral spirits. Then I assessed the colour of the sunlit areas. This is one of those confusing situations where you know the shrubbery on the mountain is green but the light shining on it leans strongly toward red - green's complement. So what colour is it now? It's a sort of red-green-yellow-orange-brown colour. I used my handy-dandy oil colour chart to find a starting point and settled on a combination of cerulean blue (a green-blue), mixed with cadmium yellow deep (an orange-yellow) and added permanent crimson (a purple-red) to warm it up. I washed a mix of burnt sienna and permanent crimson on the sunlit area first to provide a warm, earthy base for this "green". I approached this painting a little differently to how I usually paint on site. I didn't try to take any area toward a finished state and just laid in large areas of general colour until almost all the white primer was covered. I didn't even take these areas up to each other, at first. Once I had it all mapped in, I went back over all areas with heavier colour and closed all the gaps that I'd left in the early stage. The shadows moved fast and I found the thumbnail sketch an invaluable map of where I was headed. You can see in the thumbnail that I'd noted a small patch of sunlight right at the top of the shaded cliff face. This highlight disappeared soon after I started painting so the sketch was a useful reminder to include it - and it is important to making that area interesting enough to look at. I finished painting after sunset and had to use a small headlamp to see what I was doing as I added small flashes of colour to break up the large masses. I used a flash to take the location photo, above, just before I finished working on the painting. 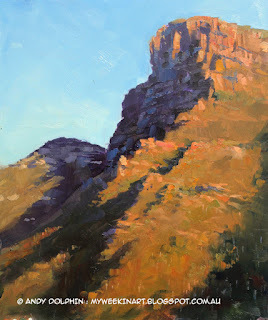 (Spring evening - Bluff Knoll. Plein air sketch.